Enjoy spectacular views from Williamsburg at The William Vale. General admission tickets provide access to the open-air venue, and an American-themed buffet (hot dogs, pulled pork, corn on the cob, your usual BBQ favorites). A full bar will be available, with drinks available for purchase. 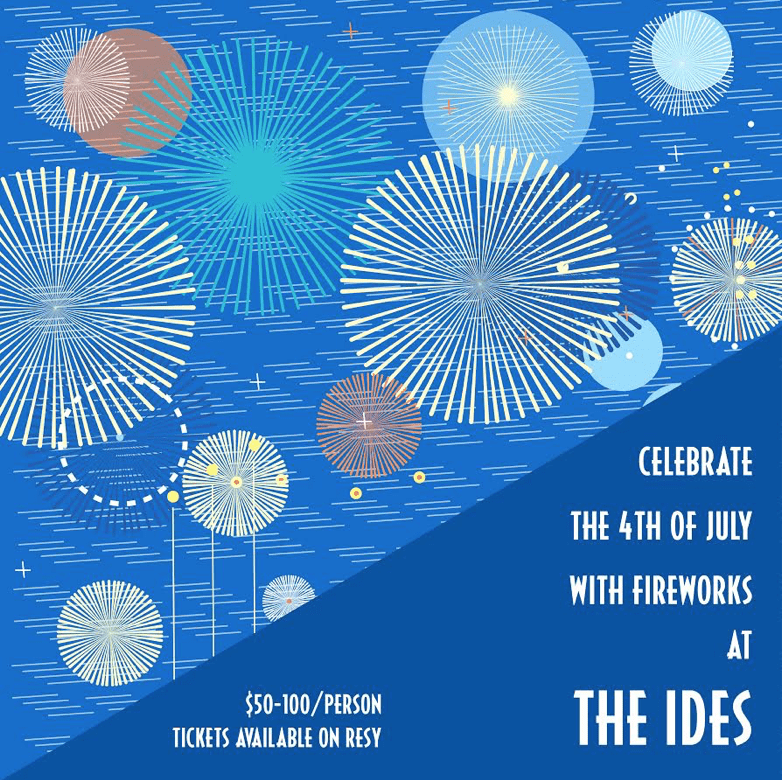 For guaranteed, unobstructed views of the fireworks and the Manhattan skyline, make a reservation for an indoor table at The Ides. Patio tables offer partial views, while standing room tickets are also available. The Ides will be offering an a la carte menu along with a selection of Fourth of July specials. Celebrate Independence Day with rooftop festivities—live DJs, panoramic views, free prizes and giveaways. Kimoto Rooftop is known for its Asian-inspired fare and exceptional city views. Put on your party attire and raise your glasses to a memorable Fourth of July. If you want to keep it casual, save a spot at your favorite waterfront park. The Macy's firework show is launching along the East River, and given its scale, will be visible from various points in Brooklyn. Head over to Grand Ferry Park, East River State Park, Transmitter Park, or Williamsburg’s newest Domino Park for views of the fireworks. Take advantage of all the activities, events, and entertainment that Coney Island has to offer on the Fourth. Start the day early—soak in some sunlight on the beach, check out Nathan’s Famous Fourth of July Hot Dog Eating Contest, stroll the boardwalk— and end the day with an impressive display of fireworks. There's a lot happening around New York City to celebrate moms and families this Mother's Day weekend. Whether it's brunch, a trip to the museum, or a stroll around the park, quality time spent together can be the best gift of all. Enjoy the spring flowers and greenery with family-friendly activities. There will be live music, games, tours, demonstrations, and fun entertainment all weekend, Saturday and Sunday. Treat Mom to a meal at the Hudson Garden Grill, or enjoy a nice picnic outside. Food trucks will be serving delicious fare, with wine and beer available for purchase. Join the fight against childhood obesity and spend a weekend with your kids learning about balanced eating. The Kids Food Festival is designed to help children establish healthy eating habits through "fun and flavorful" activities including a scavenger hunt, cooking demonstrations, and live entertainment. Don't forget to get tickets to hands-on cooking classes at the James Beard Foundation Future Foodies Pavilion. Enjoy Mother's Day Sunday in Prospect Park and prepare to make difficult decisions among hundreds of food options—from cheesesteaks and rice noodles to churros and Japanese shaved ice. Even if you and your mom have different food preferences, there's surely something for everyone in the family to enjoy. The market is also pet friendly; bring your dog along! Do you and your mom enjoy art? Head over to the Whitney for a before-hours tour of Grant Wood: American Gothic and Other Fables, followed by a two-course brunch and cocktail at Untitled. Tours start at 9:30am and 10:00am, and guests will also receive a small gift. Tickets are required. Is Mother's Day brunch a tradition in your family? Take your mom to an eclectic neighborhood joint like Palo Santo—where brunch will include a free mimosa for all moms—or treat her to a fancy meal at Michelin star rated Meadowsweet. Other recommendations include: Miss Ada in Fort Greene, Buttermilk Channel in Carroll Gardens, and Superfine in DUMBO. Springtime in the city is near magical at times, and although the weather quite hasn't warmed up yet, there’s always a lot to look forward to. Get ready to put away your winter jackets and get out into the world with this list of early spring activities in New York City. Prepare for a fresh dose of inspiration and celebrate David Bowie’s creative spirit. This is your chance to view an exclusive collection of pieces from Bowie’s personal archive—including original costumes, album art, photographs, videos, and even handwritten lyric sheets. After globally touring for five years, the show is now on display at the Brooklyn Museum for its final exhibit. Find an oasis away from the hustle and bustle of the city. NYBG presents The Orchid Show for its 16th year of awe-inspiring displays of some of nature’s best creations. With installations by acclaimed Belgian floral artist Daniel Ost, the show highlights the magic and beauty of orchid plants as “living sculptures,” each variety unique and bursting with expression. Just a spoonful of sugar—or lots of it—can turn any day into a sweet one. Indulge your sweet tooth and bring a fully-charged phone for delicious, Instagram-worthy desserts—all in one place at Dessert Goals, an NYC dessert fest. This year’s festivities are paired with a new concept—a spring disco theme that encourages you to bring on the 70s’ disco & floral vibes with your best outfits. With exclusive desserts including everything from mochi ice cream to coconut macaroons, a curated Instagram garden, waterfront views, and a savory Salt Bar, this one is not to miss. It’s almost that time of the year again… Coney Island’s Luna Park is opening for the spring and summer season, a week ahead of Easter. This year, admission will be free on opening day with a small donation (minimum $5/person) that will benefit The Mayor’s Fund to Advance NYC & Girl Scout Troop 6000. Put the April Fool’s Day jokes aside—Easter Sunday this year is on April 1st. If, in the past you thought of parades as a reason to avoid Fifth Avenue for its crowds, challenge yourself this year to witness a longtime NYC tradition. If you’re celebrating with kids, be sure to check out an Easter egg hunt in your borough. Whether you’re buying a condo or a co-op in New York City, a thorough home inspection is imperative. Before setting up your home inspection, make sure the utilities — including electricity, water and heat — are activated. Also be sure to make arrangements with management to allot enough time for the inspection (at least an hour) and find out whether you’ll be able to enter common areas. Here’s a list of some of the most important problem areas for your engineer to check during the inspection. 1. Water damage typically results from moisture entering through the roof, terrace and windows. For below ground level apartments, water infiltration from ground water due to poor drainage is also a threat. 2. If the apartment has double hung windows, inspect them to see that they remain up on their own. Newer windows often use a “spiral balance system” — which can rust, bend or break — rather than the older rope and pulley counterweight system. 3. To check for plumbing issues, ensure that the inspector uses an electronic moisture meter and a thermal imaging camera to diagnose any potential leaks. Utilize all toilets, showers, tubs, sinks, dishwashers and washing machines and examine for any leakage. Also check supply and waste piping, faucet valve systems and dishwasher door seals. 4. Be aware that older apartments often use centrally-controlled steam heat and do not have thermostats to control the temperature in individual apartments. In this case, radiators must be turned off by hand in order to lower the heat. 5. Does the building’s electrical capacity meet 21st century demands? If it’s an older building that hasn’t been rewired, it may not. 6. Inspect all of the flooring closely, especially if it’s hardwood. Look for any excessive gaps or buckling and make sure that the installation meets industry standards. If wood flooring areas have been patched, especially near a radiator, this may suggest a leak. 7. Appliances in newer, high-end apartments are occasionally installed improperly due to their proximity to expensive countertops and other equipment. In particular, be sure to check that the dishwasher is properly anchored. You’ve found the perfect New York City co-op, your board package passed the preliminary application process — and now, you’re about to meet the board for an interview. In addition to simple questions about pets, children (or whether you will have them) and if you plan on using the apartment as a home office, there may be some curve balls. We’ve put together a list of tips on how to prepare for a co-op board interview and land a coveted NYC co-op. 1. Don’t worry. You’ve already passed the most important of the process. An invitation for an interview means that the co-op board has already conditionally approved your board package based on your qualifications and financials. The interview is simply a chance for the board to meet you in person and verify details on your application. 2. Dress for an interview and arrive on time. It’s a professional meeting, so treat it like one. Wear business casual attire and aim to be at least 15 minutes early. Remember that being slightly over-dressed is always better than being under-dressed. 3. Clean up your digital footprint — and your kids’, too. Expect board members to Google you and look at your social media feeds. In New York City especially, they may check your kids’ Facebook pages according to BrickUnderground. Make sure that there aren’t any obvious red flags. 4. Know the details of your purchase application inside and out. Be prepared to quickly and succinctly answer detailed questions about your application, including your finances. Bring a copy of the application for yourself as well. 5. Determine who will answer which questions in advance. Couples should decide who will answer different types of questions and what the answer will be ahead of time. Maybe you will answer questions about finances and your partner will answer questions on lifestyle and family? It’s up to you, but you want to prepare before going in front of the board. 6. Expect the board to ask personal, probing questions. Questions about why you’re downsizing, your political beliefs, what you do in your spare time and further questions about your finances are all up for grabs. Be calm and keep your answers simple. You don’t want to argue with the board! 7. Be kind, but not over-the-top. You don’t have to sell yourself to the board, as you have already been conditionally approved based on your purchase application. Let the board interview you, and simply answer the questions they ask. The board won’t deny an applicant because the interview was too boring. 9. Don’t extend the conversation. The board already knows lots of information about you from your board package, so don’t tell them anything beyond what they ask. You never know: an innocuous comment might turn a board member the wrong way — and you don’t want them to think you will be difficult. 10. Save your questions for later. You want to come off as a low-maintenance shareholder. Hold your questions about renovating the apartment or seemingly innocent small talk like Local Law 11 work on the building’s façade. You’ll have lots of time to learn more about the co-op’s rules and culture once you’re accepted. If the board asks whether you have questions, thank them and tell them that they’ve covered everything you wanted to know. Thinking about listing your home during the winter — or even over the holidays? Despite the popular belief that spring is the ideal time to list your home, you shouldn't necessarily wait. While there are fewer buyers, those who are looking in the winter tend to be more serious. Furthermore, fewer homes listed on the market in the winter can mean less competition. Prepare your home for sale during the off-season using these tips, and you’ll be well on your way to having a buyer before springtime. During the winter, a warm home is a necessity. Triple check that your home heating system is in working order and your home is properly insulated before showing your place to prospective buyers. If your home has a fireplace, make sure your chimney is cleaned and inspected. For added protection, weatherstrip your doors and windows to seal any potential air leaks. (The U.S. Department of Energy has a handy guide, if you’d like to do this yourself.) This will lower your energy costs, too! A homey atmosphere encourages potential buyers to extend their visit. De-clutter your home, cue up some classical music and warm up your living room with throw blankets and pillows. Dig around your archives for photos of your property during spring and summer, too, to show what your place looks like year-round. Brighten up your home with a seasonal touch for the holidays, but don’t overdo it and keep your decorations free from religious themes. Stacked wood by the fireplace, candles, pine cones and holiday flowers will make your place feel warm without distracting or offending potential buyers. Make sure you don't price your home above market value. If the asking price is too high, it’s likely to discourage potential buyers — especially in the wintertime. Studies show that the week a listing goes on the market, it receives nearly four times more views than it does a month later. If you reduce the price later, it won’t get the same attention. Buyers on the market during the winter are often more serious, for professional or personal reasons. Be flexible with showing times, even if they may interfere with other holiday activities. Take the time and make sure you don’t miss an opportunity. Set open houses in the morning or early afternoon on clear days, if possible, to show off your home in sunlight. Your place simply doesn’t shine at night or during a snowstorm. Despite winter’s inevitable frost and snow, tidy up the stoop and sidewalk. Make sure there’s a clear, hazard-free path to the door — and maybe even spruce up the entryway with seasonal décor. Your real estate photos need to be especially vibrant, especially during the winter when potential buyers are more likely to browse listings online. Make sure to include photos of your home in spring or summer to show off your property in a warmer, lusher light. Your listing agent should be available and reachable for your buyers even throughout the holidays. Remember that people who are home hunting during the holidays are often on a tight deadline. With help from your agent, focus on time sensitive buyers that are relocating for work, have a 1031 exchange deadline, or a family event such as a baby on the way. Credit bureaus can make errors, so make sure to check your credit reports closely for accuracy. Pull your report from the three major credit bureaus (TransUnion, Equifax and Experian) or a free credit report website like credit karma and go through them line by line to look for issues. If you do find a mistake, file a dispute either online or by mail to the bureau. The agency will investigate your inquiry within 30 days. High credit card balances are sure to spoil your chances for a good mortgage, as it makes both your credit utilization ratio and your debt-to-income ratio high. At the very least, consistently pay more than the minimum on your cards each month before sending out mortgage applications. You’ll save money, and you’ll show potential lenders that you’re reliable to repay what you borrowed. An older average account age improves your credit profile. Hold onto all of your credit card and home equity lines, regardless of whether you use them. Just one late payment can reduce your credit score by as much as 110 points, if you previously had very good credit (according to Equifax). If you’re not regularly late, your credit card company may clear this blemish from your credit report if you ask. Write a letter explaining that this mistake was just a hiccup and appeal for a courtesy adjustment. If that does not work, consider hiring a credit repair agency such as Lexington Law. They review your credit reports and then direct appropriate correspondence to your creditors and the credit bureaus with the goal of removing negative information from your report and thereby raising your score. Borrowing against your retirement plan and paying off credit cards will lower your credit utilization ratio. As retirement plan loans aren’t reported to credit bureaus, this can raise your credit score. 401(k) loans generally have a much lower interest rate than your high interest credit cards, but do note that the loan typically has to be paid back within 5 years and payments for the loan are deducted from your paycheck. Be sure to also consider the drawbacks of this strategy as it can have tax consequences and penalties, derail your retirement savings, and the loan itself doesn't address the reasons you might have accumulated debt. Increase your credit limit to lower your credit utilization rate, but only if you can keep your spending in check. A large portion (30%) of your credit score is derived from this utilization rate, as lenders don’t want to see credit cards with high balances. So, if you can convince your lender to increase your credit limit from, say $5000 to $10000, this will decrease your utilization ratio — as long as you don’t spend more as a result. As tempting as it is to open a new credit card or take on an auto loan when you’re buying a new house, wait until the mortgage is finalized. Lots of credit inquiries aren’t a good sign for lenders. Do your research before you start applying for mortgage loans. 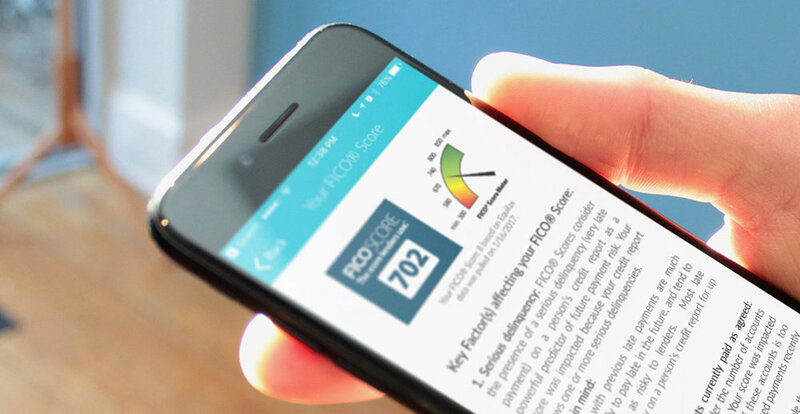 Your FICO score begins to register mortgage applications as separate inquiries after about a month. This effect is even greater on other scores, like VantageScore and an older version of FICO, which take each mortgage application as a separate inquiry if they’re separated by more than two weeks according to NerdWallet. Improving your credit score is a slow-and-steady process, but the reward is great: you’ll be able to buy your home with an excellent mortgage rate and a low monthly payment. Spend some time analyzing your credit report, focus in on reducing credit card debt and be smart with your credit and you’re well on your way to securing a mortgage and owning your dream home. The list of people coming to your holiday dinner is getting larger by the hour, the apartment is looking presentable and the turkey is on its way. The holiday spread could use another unique, memorable flavor though, and a quick shopping trip in the neighborhood has you covered. We’ve put together a list of shops in the area to pick up those last few necessities to make this Thanksgiving one to remember. Beam: Add some elegant quirk to your holiday set up at this celebrated Williamsburg home décor shop. This chic designer offers a selection of housewares including unique tableware, home accessories and unusual accoutrements to add a festive touch to the fall celebration. Blanc et Rouge: Never forget the wine — especially on Thanksgiving. 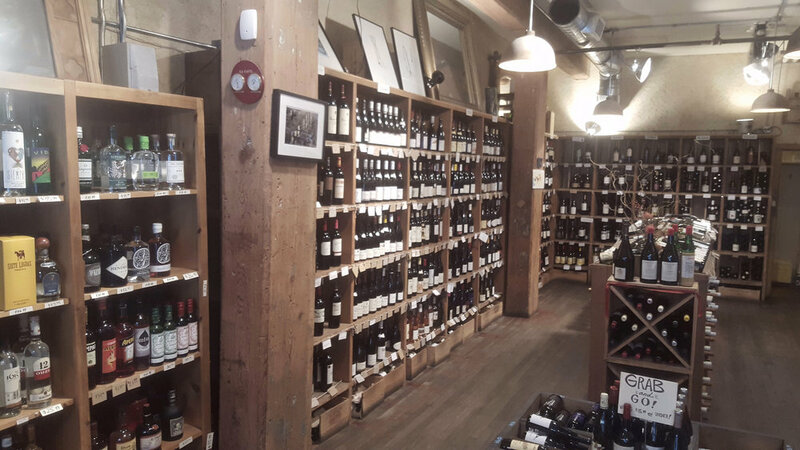 The fantastic DUMBO wine and liquor store features eco-friendly options as well as older vintage bottles at all price points, and very knowledgeable employees. They have a worthwhile selection of fine spirits, too. BKLYN Larder: The European-style specialty shop in Park Slope has just about every last minute supply you’ll need: from Puglian olive oil and dried pastas to vegetables, cured meats, cheeses, a variety of prepared foods and baked goods. There’s also a selection of options for the vegan — or wannabe vegan — in the family. Four & Twenty Blackbirds: A Brooklyn Thanksgiving isn’t complete without a pie from Gowanus’ Four & Twenty Blackbirds. Handmade crusts, local fruits, and mouthwatering options make these pies worth the hype. Try the matcha custard, the plum cherry oat, and the decadent salted caramel apple pie. 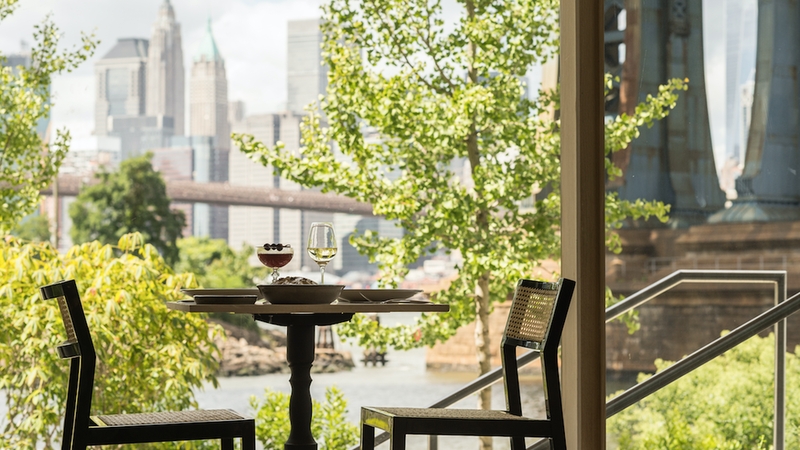 Dine at the new DUMBO eatery Celestine, which features traditional Thanksgiving fare and an incredible waterfront view. Their menu of roast turkey with chestnut stuffing or braised short rib, brown butter sweet potato soup, brûléed yam casserole and roasted brussel sprouts will make you feel right at home.